Woohoo! I won an award! Lisha has awarded me The Yostie Award! Thanks, girly. To learn more about what that is, click here. In turn, I'm awarding Alana of Mrs. Alana's Miscellany the award. Congratulations! I recently started following Alana after seeing her name pop up a few times on other blogs I keep up with. I thought, "Oh, she sounds pretty cool!" so I hopped on over to her page and realized...she IS cool. 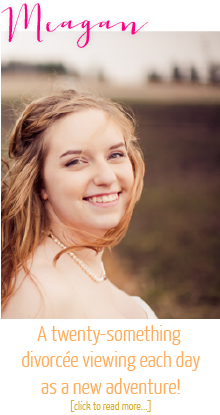 Alana is a fellow military wife, married to an Airman, and she's super cute. Check her out! DIY Pegboard Jewelry Organizer: I loved this adorable and easy DIY project! Alana just used an everyday peg board to create a stylish display for her jewelry and it turned out great! I especially love her wedding hanger above it. I've been looking for a way to display mine, and I think she chose the perfect spot to show off her new last name. First of all, you need to choose a blog that you’ve really been enjoying lately. 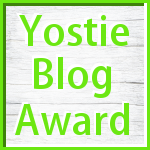 Go submit the blog you chose at the Yostie Blog Award Hall of Fame. Then write a blog post honoring the blog you chose. You must include two of your favorite blog posts from that blog to link to. The post must include these rules. That's all! Congratulations again, Alana! Bloom Into Spring Exchange: Show Off Your Loot! Reminder: Bloom Into Spring Exchange!